I’m guest blogging today here: http://shawnawilliams-oldsmobile.blogspot.com/ and thought I’d have a guest here today, too! JILLIAN: I’ve known Darlene for a very long time – about sixteen years, I think. She’s a trip and a lot of fun and I’m glad to have her here today to visit the old blog. DARLENE: Thanks Jillian for having me drop by and let me share a little bit about my story Dog Day Afternoons. This story was a bit of an adventure to write. I am fortunate in that I have more story ideas than time to write. But my publisher wanted a story about a dog and I had nothing. I probably spend six weeks a year in other people’s homes taking care of their dogs, but I’ve never thought of myself as a dog person. You’d think a dog story would come easy, but oh no. Finally, a friend gave me a great idea about a dog escaping and the story was born. The story has three main characters. It’s the classic boy meets girl with a dog thrown in, let me tell you a little about them. The dog in this story was modeled after a real life dog. His namesake Buster, was my friend Peggy’s dog. He was a great big beast of a dog that scared the beejeezus out of me the first time I met him. Once you got to know Buster though he was a sweetie. Jessica is the heroine, she’s purely fictional. If this was going to be a movie, I’d see Reese Witherspoon in her role. The hero, Ewan he’s a former teen idol going through and messy divorce (think Paul McCartney here), hiding out in Florida. Ewan is not Paul McCartney though, he’s Scottish so I listened to every Bay City Roller song I could find on YouTube while I was writing. It made me feel like a teenager again and crush on my character. It was great fun to write. 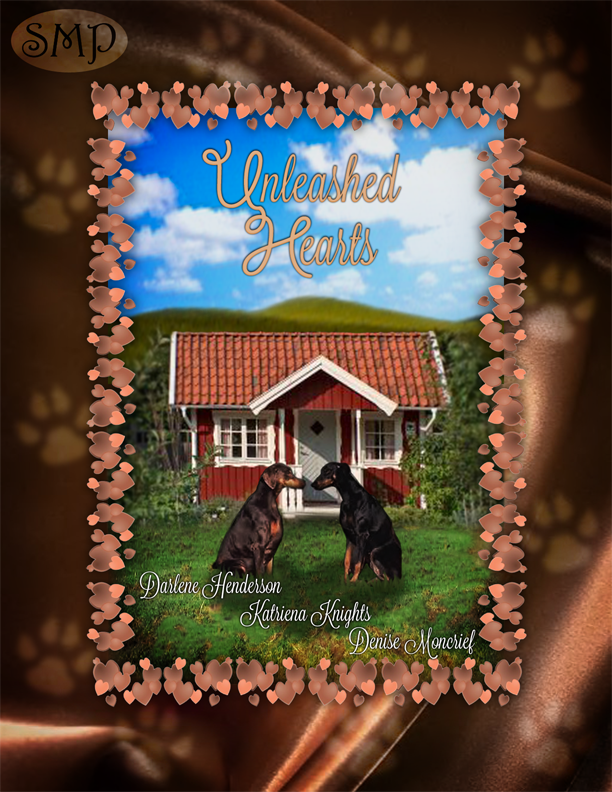 There are several places you can get a copy of the Anthology, Unleashed Hearts. Jillian, thanks so much for having me. I can’t go without congratulating you on your latest release. The Gambler is a great book. I understand that it is the first in a triology. Can’t wait to see what comes next for the McSwains. Good morning Ciara. Thanks for dropping in to say hello. This one isn’t a dog POV but now I am imagining all the things he would have thought. HMMMMM. Jillian, thanks for having me stop by today. I’ve been a fan of this blog for such a long time it’s an honor to be a guest. Thanks Danica. It was great fun to write. I hope he’ll bring to mind someone special for all my readers. Looking forward to see what you have to share tomorrow. I love Fridays. Thanks for all the comments, ladies! Glad you’re all making Darlene feel welcome! Oooh. I love dog stories. Shhhh! Don’t tell my 17 pound cat, Dude. Of course, he thinks he’s a dog. Best of luck with the anthology, Darlene. I love what Still Moments is doing with these. What a great idea! Laurie, my friend Shirley’s cat Frankie is my cat boyfriend he would so pout and be mad at me about this so we’ll keep it a secret. Thanks for visiting I’m so glad to be part of the Still Moments Team. Dropping in to say hello. Congrats on the release. Thanks for dropping in Lynn. Can you tell I’m super excited about this release? Congrats to Sherry and Darlene on your new releases. Have both and can’t wait to read them! Hey Sandy. Thanks so much. I can’t wait for your release date. I appreciate you dropping by to say hello.